Spring is finally here! We are loving this beautiful dress by Joseph Ribkoff. It is comfortable, fitted and absolutely gorgeous on. Joseph Ribkoff is known for making formal dresses that can be worn in the office, to cruises and even weddings. We paired this dress with Brighton's new jewelry collection "Tamal". Brighton's Tamal collection. This fine jewelry is set with Swarvoski crytals and has an open work design that is unique and one of a kind. Talk about boho! This dress by Coco Carmen yells comfort. Not only is it flowy but the fringe detailing on the bottom gives it unique look. You can even wear a light shawl, cardigan or jean jacket for those chilly spring nights. We then paired this dress with an Uno de 50 necklace and a Christo Cuff bracelet by Brighton. Brighton's Christo Sydney Wide Cuff Bracelet. You can even purchase leather inserts to give it another look. Uno de 50 I Will Survive necklace. Made with long leather, silver plated beads and a pink Swarovski crystal. This next dress is by Last Tango. We are in love with the cut out detail on the arm of this dress. This dress is made to flatter any body type and the color is to die for. We added a colorful scarf and a Brighton handbag and bracelet to finish the look. Brighton's Tivolu Tote made with top grain leather. 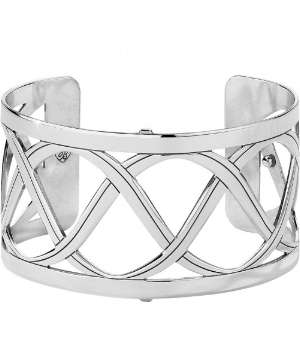 Brighton's Eternal Sky Wide-Hinged Bangle.